Conversations with a Hypoxic Dog began on May 1 of this year. This edition launches a new format. Words and Language and other Nonsense will remain the focus; but a bit of History will be added. Additionally, I will now publish just once a week, on Wednesdays. This edition continues downriver with Lewis and Clark just 140 miles from the sea. 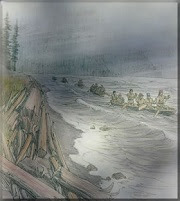 As the river widened, the current slowed and became shallow with sandy beaches at what the explorers called 'bottoms.' The weather, too, changed. Once through the heart of the Cascade range, the arid eastern reaches gave way to a " ... countary a high mountain on each side thickly covered with timber, such as Spruce, Pine, Cedar, oake Cotton & & ... " And more often than not they woke to " ... cloudy rainey disagreeable morning[s] ..."
The journals of Lewis and Clark noted 128 "rain days" from November 1805 (Beacon Rock) to March 1806 (Fort Clatsop). An average winter for northwest Oregon. Astoria, for example, recorded 127 days of rain during the winter of 2003-2004. "Rained all the after part of last night," wrote Clark on November 5. "I slept very little ... " And on the 6th, " ... A cool wet raney morning ... "
As wet and disagreeable as the conditions were, when the wind began to blow their troubles multiplied. The Gorge, as is well documented, is a wind funnel. When high pressure sits to the east and low pressure flows in from the coast, the resulting pressure gradients create strong winds that increase in velocity as they wend their way through the constrictions of the Gorge. Folks in Corbett, a small town perched on a bluff above the western end of the gorge, like to tell visitors that they use anchor chain for a wind gauge. If the chain hasn't lifted off the ground, it's not really windy. The winds from the Land brings us could and clear weather while those obliquely along either coast or off the Oceans bring us warm damp cloudy weather. The hardest winds are always from the S.W. This is a typical weather pattern for the winter months on the Oregon coast. Had he spent a summer in the Northwest, he would have noted a shift in the pattern. The wind, he would find, would come primarily from the northwest. With this shift, the rain relents. Winter months in the Coast Range bring 140 inches of rain; summer months receive less the ten inches. In the summer of 2004, I paddled a sea kayak from Beacon Rock to Cathlamet (RM 40) and then, off the river, through the sloughs to Skamakawa and on to the Lewis and Clark Wildlife Refuge. My journey was done in stages over the course of the summer. No broken canoes or lashing rain and wind. Not far down river from Beacon Rock, paddling the Washington side to stay out of the main channel, I picked up a bit of breeze and some chop. When the wind is from the west, against the river's current, it can kick up waves and white caps in short order. Running your hand against the lay of your hair gives you the idea. The river was getting the least bit tousled. Into this head wind, I sat up and put a little more muscle into each stroke. Ahead on the river were two aluminum fishing boats bobbing up and down in the mouth of Skamania Island's north channel. "Can't be too bad," I thought. "Just the wind getting funneled past Skamania. No problem." I put my head down and paddled harder. Chop became two foot waves with their tops blown off. I began taking water over the bow as I slapped into the face of the waves. I knew the boat was up for the conditions (it was a sea kayak after all); but the paddling was beginning to get too much like work. I peered down river looking for my fishermen. They, more prudent than I, were gone. One more faceful of water made up my mind. I steered for the east end of the island, into the relief of shallow water and respite from the wind. Laughed at myself. Turned tail and skedaddled, ya did, I thought. But then, as the old climbing adage goes: there are bold climbers and there are old climbers; but there aren't any old, bold climbers. 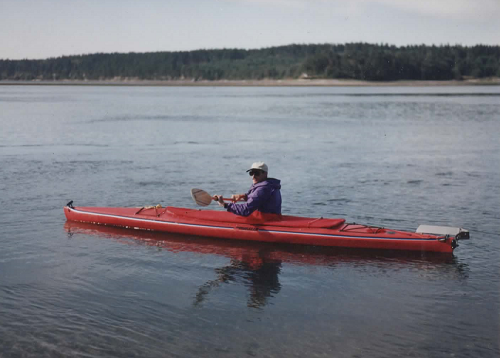 I eased over to the lee of a bend on the Oregon shore and paddled down river. Please leave a comment or question in the Comment's box below. You may add your email address or publish anonymously. Preview your comments, then Publish. The Z-dog thanks you.